Steven Gullotta Other Featuring three separate artists each based around the dark ambient and drone genres, Distant Skies is a four track release coming off of GV Sound. And, with that said, and without having to say much more, I would like to introduce the first artist that makes an appearance on the album. My Dark Lake. The Belorussian act does not disappoint as usual, with their contribution to the album, Countess Winter And Old Cemetery. At first beginning off with a very spacial, almost crystallizing effect, a light tune starts coming in around the minute mark. As the wind swept atmosphere of the song breathes, I found myself lost in tranquility. Towards the end, I was delivered a sort of sound that echoed of a musical box and sent the song off real nicely. His other piece on the album was a cover of a song by a Russian group, The Matrixx. It was extremely interesting to see how a mainly electronic project's song could be transformed into a dark ambient piece. However, it was done well, and became a song of its own. Songs From A Tomb delivered a nineteen minute track that mainly played with a drone tone. Seeing that there was one main note always present, changing here and there, surrounded by little else, it was surprising to see that the song worked well. Perhaps it was the the pure feeling of being in a large, mesmerizing dome that showed you the stars above that did it, Whatever the case, the song was pretty good. It may have dragged on for a few points, but it always made me come back to it. 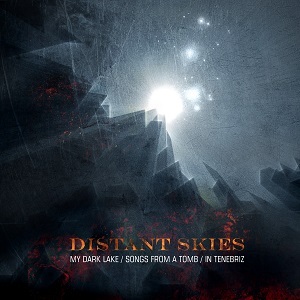 And, the last song that I have to touch upon would be In Tenebriz's And We Fade In Storming Sky. This was another drone piece. However, this is the piece that I perhaps have the most problems with. The first four and a half minutes of the song, with a singular note that just changed slightly here and there. And even then, when the song underwent a transformation, for the next three minutes, I was hit with a nice spacial sound, but that's it. It wasn't until the final five minutes that I got a steady beat and really was able to enjoy myself. And, as the final five minutes went on and more sounds emerged, I was really sucked into the song and leeched onto it till the very end. Featuring three separate artists each based around the dark ambient and drone genres, Distant Skies is a four track release coming off of GV Sound. And, with that said, and without having to say much more, I would like to introduce the first artist that makes an appearance on the album. My Dark Lake. But, all in all, I really enjoyed this release. To say that I truly enjoyed a drone song to the fullest is tough, for normally I find them mediocre at best. However, Songs From A Tomb convinced me otherwise. As usual, My Dark Lake served up two fine and dandy songs that I will catch myself listening to should I ever need to relax and be at peace. And, with In Tenebriz's song stumbling along, it at least found it's place within the ending, but that's what really matters. The pleasure I received from listening to this album was short of dreamy.